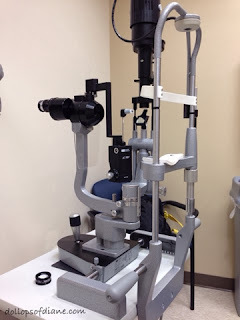 Dollops of Diane: My First Eye Exam: Am I Going Blind? On Sunday I started seeing random, black, squiggly lines (also known as "floaters") in my line of vision. They actually came on pretty quickly and frequently while I was at church with the boys. Of course, I immediately started thinking things like "What is wrong with me?" and "Am I going to pass out?" Luckily, they subsided long enough for my rational brain to assume I was fine. However, I've been continuing to see them pretty frequently since then. They happen most often when the light changes like from outside to inside or walking in to a bright room. So like all people who are deeply concerned with their health, I took to the internet for a comprehensive diagnosis. The conclusion from the internet was that I was just getting old and my eyes aren't as good as they used to be. However, there was a tiny chance that my retina was detaching so I decided to make an appointment with the eye doctor. I mean the last thing I needed was to wake up blind one morning, right? I've actually never had an eye exam before in my life. My vision and eyes have always been great so I've never needed one. Well I went this morning and the verdict is I'm totally fine. I guess the jelly in your eye can clump up and that's what causes the appearance of floaters. Yes, that's my official medical description! It's not going to go away but I'm told I'll get used to it. While I was there for the exam I had my eyes dilated. Now I know that this is a common occurrence and people get it done all the time but HOLY SMOKES. I had no idea how blurry my eyes would be. I literally couldn't (and still can't really) see anything. I got a text message in the office and couldn't even make out the name of the person it was from never mind the actual message. Hours later my phone still looks like it's been taken over by hieroglyphics. I don't know if because my eyes have never had anything done to them before they are even more like "WHOA! What is going on?!" or if this is what everyone's eyes are like. If so, why aren't more people talking about this? Is it because people are smarter than I am and assume that no one cares about their blurry vision? Well let me tell you - I can't see a thing and I am SHOUTING it from the rooftops. Seriously, it's insane. PS- Please excuse typos in this post because well I can only see half the letters.